National Institute for Materials Science (NIMS) is playing a central role in coordination with academia, including TIA core institutes, in providing a venue for collaborative research with industries to create environmental and energy technologies using nanotechnology. We encourage a wide range of industrial partners both in Japan and abroad to participate in Nano-GREEN (Global Research Center for Environment and Energy based on Nanomaterials Science) to accelerate R&D in materials technologies. We arrange various forms of collaboration with companies according to their request. At Nano-GREEN, we aim to conduct efficient R&D through coordinated and integrated utilization of materials technologies developed by NIMS, advanced measurement technology, and computational science. In order to develop a sustainable society, we are promoting basic R&D of materials and technologies in the areas of environment and energy. 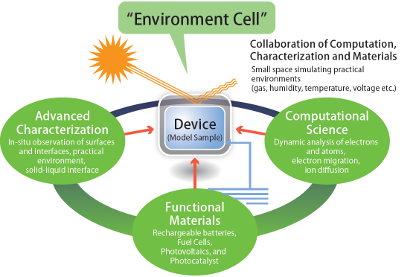 In particular, we are making majo efforts for the studies on all solid-state rechargeable batteries, lithium-air rechargeable batteries, and on perovskite solar cells to address common technological issues with an all Japan formation of collaborations between industries, government and academia. We will identify the basic mechanisms of the surface/interface phenomena which will be the key for the function of the relevant materials by making the best use of environment controlling technology developed by NIMS. 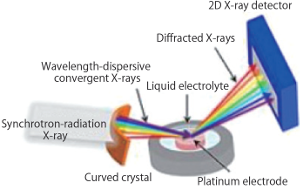 atom transfer, and ion diffusion, etc. 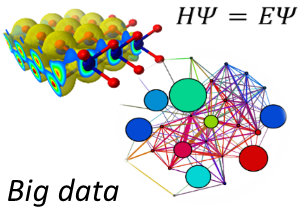 We aim to understand electron/atom dynamics at nanosurfaces/nanointerfaces, which form the basic principle of energy conversion, using a sophisticated computational scientific method. Based on the knowledge gained from those studies, we are also drawing up guidelines for designing new materials and functions.